Hand Knitted Nutmeg Brown Wool Blend Hat from India, "Himalayan Comfort in Nutmeg"
Stay warm in style with this soft and cozy wool blend hat from India. Hand knitted by artisans of the Himalayan Naari, this nutmeg brown hat features a diamond honeycomb pattern and neat rim that come together to create a simple, but attractive accessory. 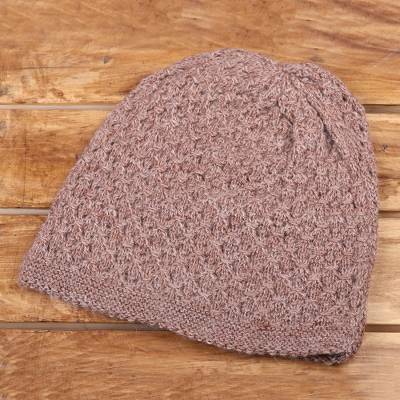 You can find wood blend hat 'Himalayan Comfort in Nutmeg' by Himalayan Naari in accessories categories such as Wool Hats, Wool Blend Hats, Polyester Hats and Knit Hats. Enjoy exploring these sections for other Novica treasures.